Joining a club is a great way for beginners to experience the wide range of exciting opportunities on offer within the world of boating. Although boating clubs offer ample opportunities for social interaction and organised racing events, they are not merely social clubs and those just looking for such amenities as convenient boat storage, changing facilities, security and training courses can find them as vital a part of their boating experience. Boating clubs can specifically cater for sailing or motor cruising or powerboating or, as is becoming increasingly common, all disciplines. Boating clubs can be found on inland lakes and rivers and all along the coast. A search facility is available on the Royal Yachting Association (RYA) website. Boating clubs vary dramatically in size, facilities and event programmes and membership costs vary accordingly, so it is sensible to visit a number of local clubs to assess how well they meet the specific needs of the boater. A casual boater, for example, who sails once or twice a month, might be better suited to a small club with basic storage facilities. Conversely a serious boater keen to be involved in regular competitions and an active social scene might look for larger and better equipped club with an extensive events programme. Most clubs are very welcoming of families with children but it is worth considering whether the focus of club is on families or the sporty boater as its facilities will likely reflect its primary membership. Events and competitions form the backbone of many clubs and typically take place on a weekly basis. These could include races, organised group cruises or social gatherings featuring a variety of boating activities along with food and entertainment. Races and cruises variously take place up and down rivers, across lakes or, more ambitiously, across seas. For instance France and the Channel Islands are common destinations for south coast boating clubs. Club fees vary depending on the facilities they provide but for example, an ordinary sailing club with good facilities at a pleasant inland lake will cost around £100 to £150 a year for a family, a price which may include the cost of a dinghy berth and the use of the slipway. More elaborate clubs catering for all types of craft and with a full programme of events can cost around £500 for an annual family membership. Students receive large discounts as do under eighteens joining individually, who can expect to between £30 and £50 regardless of the class of the club. There are also often special rates for temporary visitor membership and friends of members are allowed to join in club events subject to restrictions. It is typical for most clubs to demand that all members’ boats under its supervision have at least third party insurance. 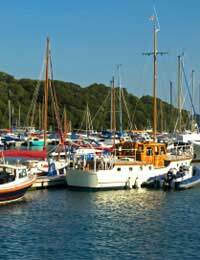 Whether it is a group cruise to the island of Guernsey, powerboat racing down the Solent or socialising with seasoned sea dogs, a club is there to broaden the mind of the keen boater.